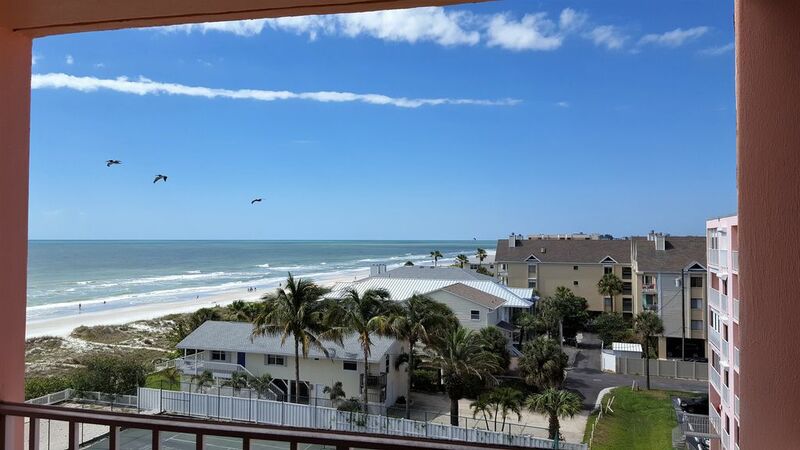 Spacious three bedroom condo on Florida's Sun coast. The unit was recently upgraded with King sized bedroom set, stainless steel appliances, a 50 inch HDTV with expanded digital cable, clean white Kitchen cabinets with a view of the ocean through the balcony. The unit is located on the top floor of the building and has the largest floor plan in the building. The building has heated pool, Jacuzzi, tennis courts, and deck and table and lounge chairs. The bedrooms have one king sized bed, one queen, and two twin beds. Just added gorgeous tile to the living room/dining room area, and all thru out the house, and there is a nice living room set. Also the the second bathroom shower was remodeled. Also added nice window blinds for privacy. Amenities: Private balcony with patio furniture, overlooking pool, and Gulf of Mexico. Unit comes with washer/dryer, color TV (cable), Icemaker, dishwasher, disposal, wet bar, outside gas grill, and children's swing-set.